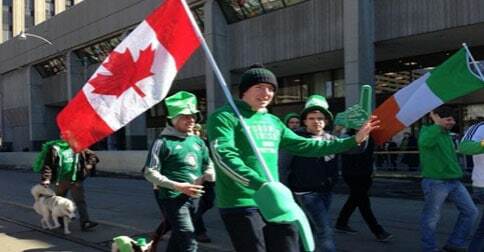 If there’s one day that most Irish expats living in Toronto are looking forward to every year, it has got to be St Patrick’s Day. Downtown Toronto went “green” on Sunday as the Canadian city celebrated the event with an annual parade. The celebrations were a fun spectacle because everywhere you look at, you’ll see green. The people in the parade wore green, the revellers wore green, as did the dogs they brought with them to see the parade, which started from Varsity Stadium and then winding its way through Nathan Philips Square. Mayor John Tory was amongst those who marched in the parade. He was accompanied by Toronto police chief Bill Blair, who was serving as the parade’s grand marshal. The mayor wore an eye catching lime green jacket during the parade. It had patches and colourful buttons on it and he was more than happy to show off his attire to the members of the press who were covering the parade. “I picked out this jacket at Honest Ed’s … it’s a bargain,” Mayor Tory told CBC News. Police chief Blair, on the other hand, revealed that both his parents had Irish ancestors and he is very proud of it. “It’s a part of our heritage and a heritage we celebrated and we’re very proud of,” the police chief was quoted as saying. Earlier in the day, Blair and Tory have been invited to a St Patrick’s Day breakfast. The event was attended by Ray Bassett, the Irish ambassador to Canada, and Irish Minister of Foreign Affairs Charles Flanagan. Meanwhile, on a related note, a park honouring the memory of those who helped Irish immigrants who fled the deadly famine in the mid-19th century is to be erected in Toronto’s downtown condo zone. The park will be built in a small patch of pavement in front of a 47-storey condo at the corner of Adelaide and Widmer Streets. It will be named in honour of Dr George Robert Grasett. Dr Grasett died of typhus while treating Irish migrants who had fled the Great Famine in the 1840s. The park will also be dedicated to his colleagues Susan Bailey and Edward McElderry, who helped him treat the sick.